With so many players out of the game this week we're having some trouble understanding the market's moves. Volume on the New York Stock Exchange has been below average, with only 1.1b shares traded on Monday, and 1.4b yesterday. 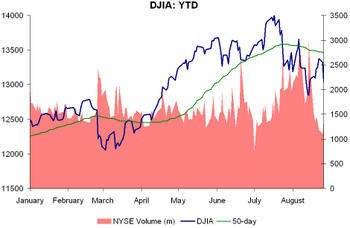 We do not suggest that a lack of volume accounts for recent market declines, but it is possible that many investors will look to take advantage of bargains when they return to work on Tuesday. As highlighted last week, market technicians seem to be paying close attention to the Dow, while allowing the S&P 500 to run its course. Friday and today are no exception. 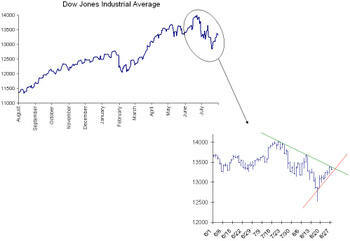 Below we highlight recent Dow trading, and note that the Dow Industrials peaked on the downtrend established between the 7/19, 7/23, and 8/8 closes. With the peak noted, we point out the shorter term uptrend established after the 8/16 rebound on the 200-day. The judgment call will be left open to interpretation. 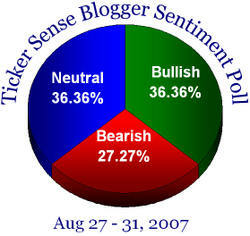 This week's poll remains bullish, although many bloggers have moved to neutral. 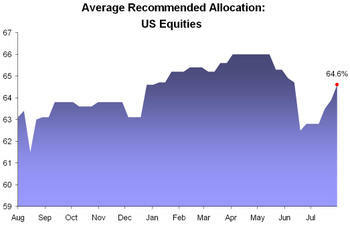 Below we highlight the 40 highest yielding dividend stocks in the S&P 1500. After seeing how the US markets responded to the Dow touching its 200-day moving average, we would have to infer that many traders look to it as a better measure than the S&P 500. While we did notice that the S&P 500 encountered some resistance at its 200-day, we cannot deny the nearly perfect bounce the Dow Jones Industrial Average had off of its 200-day moving average (this using closing prices). With this in mind we did some further analysis looking at the Dow in relation to its moving averages, and their distribution through the current bull market (beginning on 10/9/02). 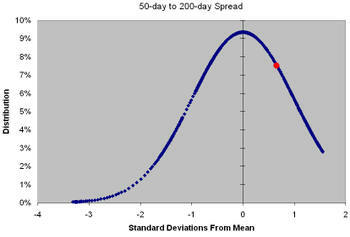 For starters, the 50-day spread is below average. 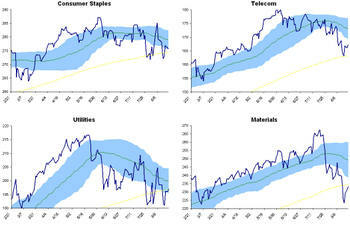 This is not surprising seeing that in a bull market we would expect the index to remain mostly above its moving averages. 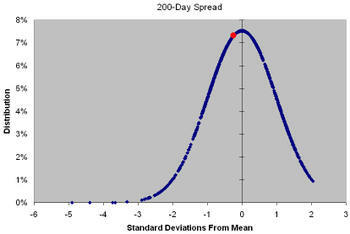 Surprisingly, the 200-day spread is only slightly below average. The 200-day spread at the beginning of the correction was 10%, or 1.35 standard deviations above average for this bull market. 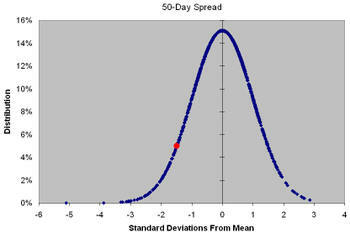 Perhaps the most interesting point is the fact that the spread between the 50-day and the 200-day remains above average. The current spread of 4.9% is 0.66 standard deviations above the 2.1% average spread, to be exact. In our view, barring some outside forces such as the Fed, this would suggest that the market will trade sideways until the 50-200 day spread narrows. 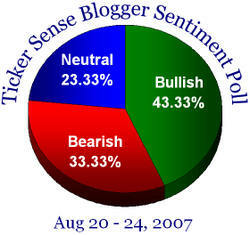 What's going on in behind these dull market days? The Dow and the Telecom sector have had nice bounces off their 200-days. 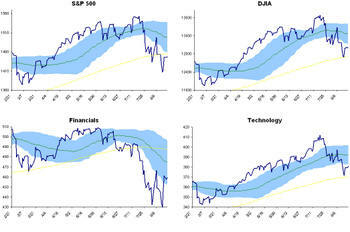 Technology has held above the 200-day, and the S&P 500 is now finding intra-day resistance at the 200-day. During the recent market correction we noticed a seldom seen 100% spike in the VIX Index. 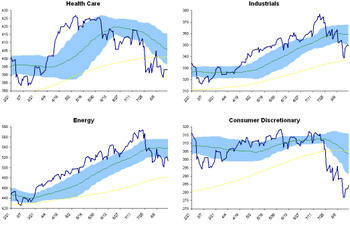 We looked back over the VIX since its inception in 1990 and found four other similar such periods. We should point out that this analysis must be taken with a grain of salt, because there is a direct correlation between the VIX and the speed of present market declines. 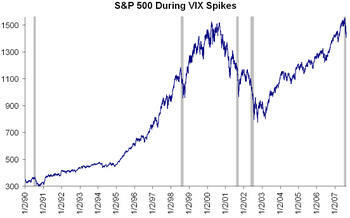 In other words, when the S&P 500 goes down quickly, the VIX goes up quickly. 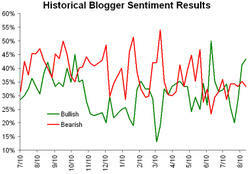 Below we drill further into these periods of a spike in the VIX to see where the worst day occurred. Not surprisingly, it is always near the end. The graph below divides the period that the VIX increased into tenths, the left is the beginning of the period, the right is the end. The current period came in nearly in-line with the spike in June, 1990; however, the worst day was more in-line with July of 1998. We should also point out that all of the periods occurred around the summer months, and on average the market gains in response to the spike. As many of us who were watching the market today know, the S&P 500 today erased its gains for the year and is now down 82bps YTD. 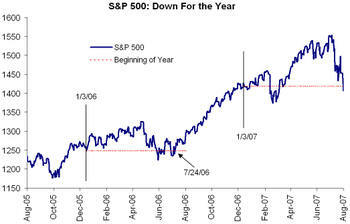 Below we compare our current situation to last year, where the market was down for the year until July 24th. An important note that many analysts discuss as the "norm" is a fall rally off of a summer low. We would hope that this year is just a little bit late across the board.